A few words about Scotts last works ride BOK228C, and My replica of the bike. BOK228C,with the frame that Scott built. This superb picture Courtesy Deryk Wylde.ORR. OK ,take a good look at the frame in this photo, this is the last incarnation of the Scott Ellis framed BSA C15, the nickel plated one, that Colin Dommett eventually bought and still owns. Now I am going to throw a spanner in the works? Because having studied all the photos and material that I now have, I have come to the conclusion that the "Black" painted frame version, the one Scott won the 1965 British Experts trial on, is a different frame to the plated later version! This was his father Sep's and used to mop up the oil on his work bench at Ariel in the BSA competition department. This Image of Scott was taken from one of the brilliant Offroad Review magazines. (picture updated on 10/Feb/2015) This Gordon Francis image from Deryk Wylde. The start of the Ashfield section just south of Rhayader in Wales. 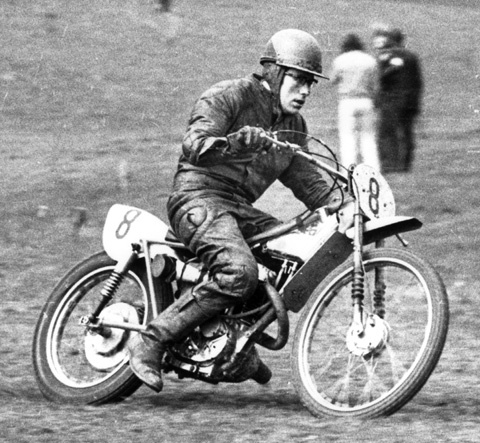 Scott riding in the 1966 British experts. 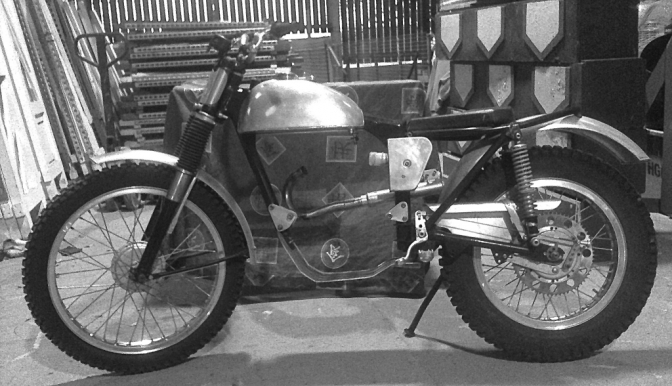 Below, is a close-up of the 1965 British Experts Winning Black frame and again used in 1966. And I think the steering head reinforcing plates are different, than I feel the later chrome plated frame had? Photo Courtesy Deryk Wylde refocused. Note the well dented front rim, When Scott won the trial the year before he still had steel rims fitted to the bike, The frame was later nickel plated? 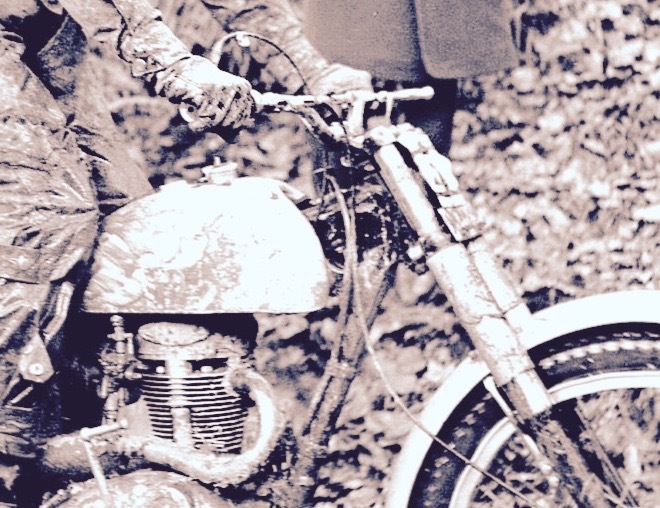 like nearly all of the BSA works bikes at this time, scramblers and trials bikes. 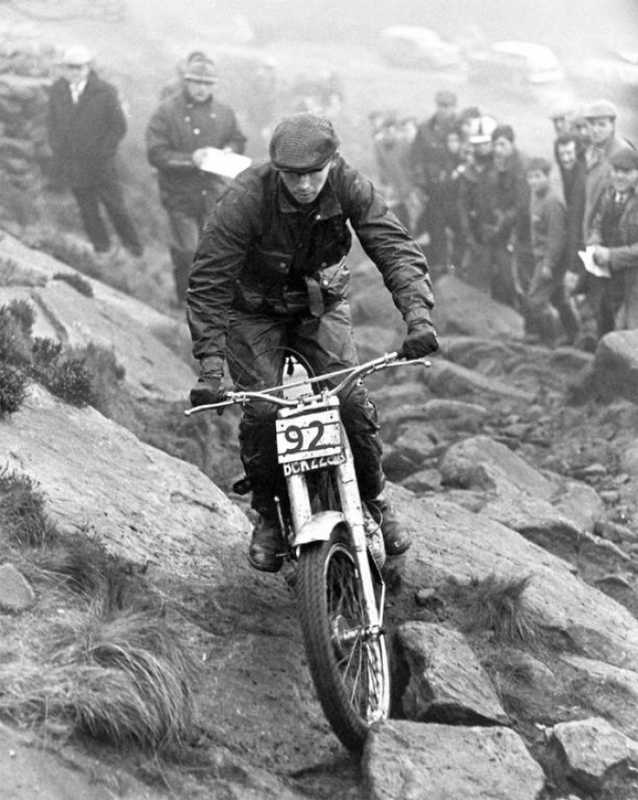 Scan from Classic British Trials Bikes.Courtesy Don Morley. I have messed with this photo I scanned until I got the best filter, to show that the gusset welding along the top tube is in a different position on the middle of the tube, where it should be, and not underneath like on the Plated frame. And the Plated frame has been gnawing away in my head for years. And it is not until now that I tried to get a better filter on one of the photos Deryk sent me, that I came to the conclusion the plated frame is different. If I was doing the exercise I would not strip a painted frame to get it plated. But that black frame had done two long seasons and It would make sense to just build another frame . 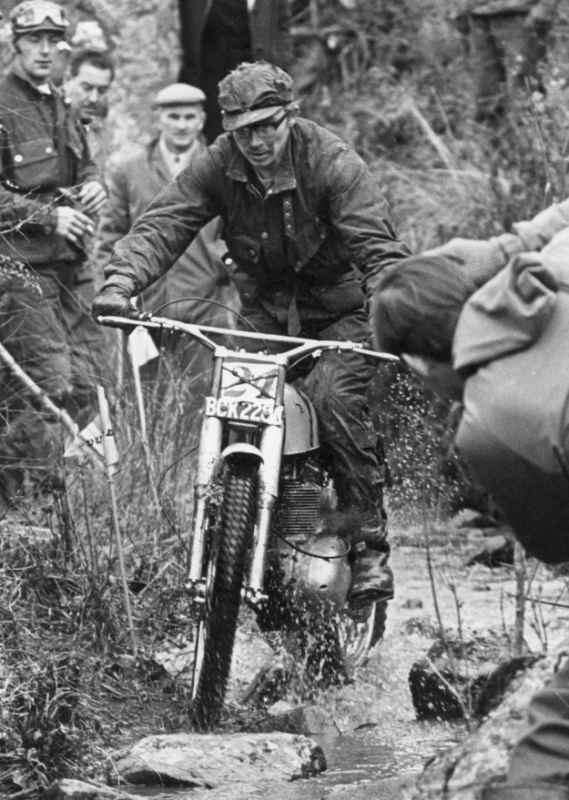 Don't forget the BSA trials team was disbanded at the end of 1965. although the riders had some good results in 1966. Scott could do what he liked with the machine he had now purchased from BSA. When I first thought about doing a Scott Ellis replica, I placed a forum thread start on Trials Central This was 2006 Title "BOK 228C is Lost". well then in January 2007 I had a personal Mail from Mike Pearce down in Andover way. He said that Mike Whitlock and him had been given the Scott Ellis frame to assess to see if it was worth their while copying it. Looking at the frame, Mike said he thought it was poorly built and very amateurish, and way out of line, and he thought the tubing used was from an Ariel frame. Don't forget I was Green on the subject then, and thought, Ha well, if that was the frame I would just do my own interpretation, and then the forum subject changed as they do, to alloy hubs and things, so basically I put what Mike Pearce said to the back of my mind. And it is not until now years later, that the relevance of what he said then, makes sense now. Well we have several versions of the way Ally Clift had stripped BOK228C down and then asked Harry Foster if he would make a copy of the Scott frame. But this frame, "Did Not", go out of Ally's keeping to anyone else. So the frame that someone had given Mike Pearce to assess must have been the first "Black" frame, that they had got their hands on from somewhere. Now we think it may have come from Tig Perry in Gloucester, when he built Scott, the second frame? So Now we have the photos blown up to see the difference in the two frames this all makes sense, perhaps Scott may even prove me right? This is what Scott said in the Classic Motorcycle,May 2010. 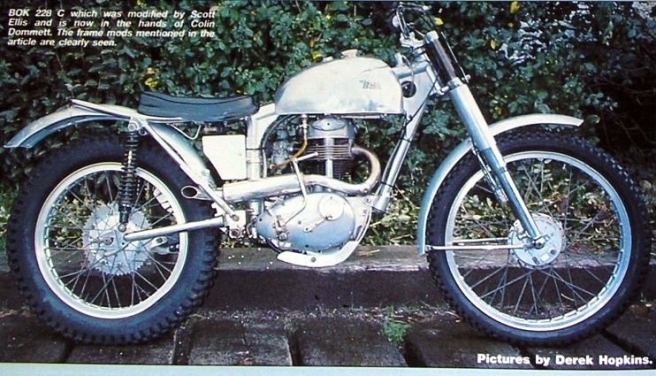 After testing Brian Martin's own bike, "BSA 250", Scott decided to join BSA in January 1965. 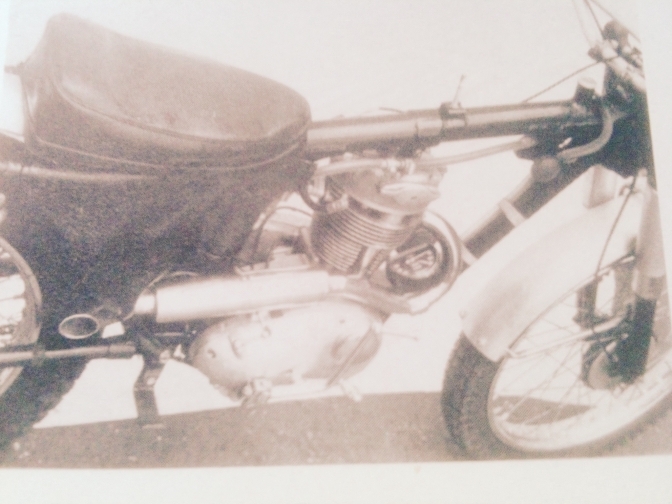 For the first six weeks or so of 1965 Scott rode Brian's bike, but then was given his own, BOK228C. But compared to Brian's bike this bike felt heavy, wide, and gutless. Being in the "A" team along with the Lampkin's , Scott had to do his best with what he had. By the time of the Scottish, he was just about getting to grips with the bike, and was having a good ride, until the big end went bang. Photo Courtesy Deryk Wylde "Offroad Archives" photo taken by Gordon Francis. 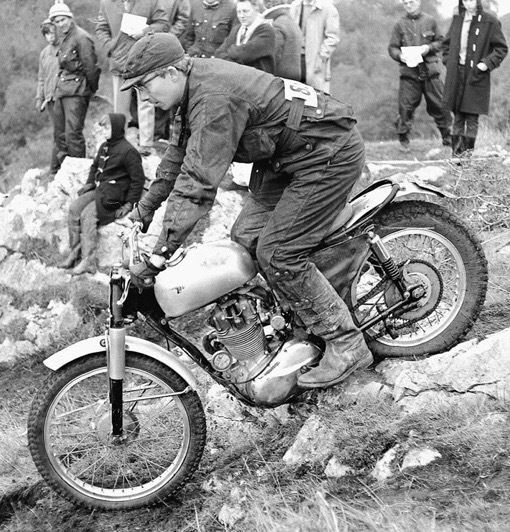 Here is Scott riding that first works C15T on White Rocks in the 1965 John Douglas trial. Note the "Works" mod to the frame, Brian Martin and Scott took a Large hammer and piece of timber to the front fork down tube? 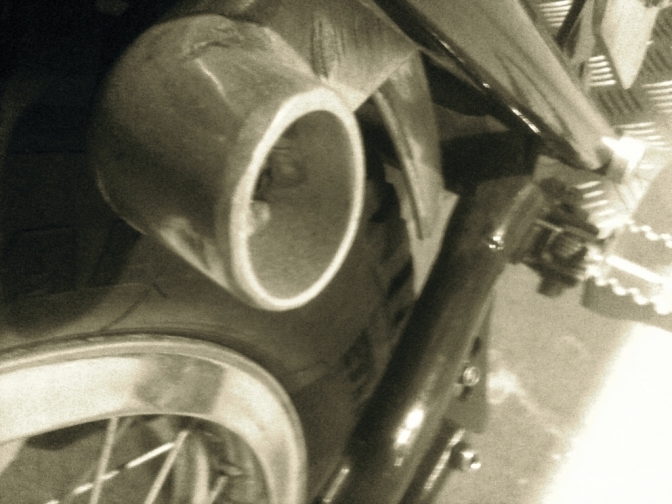 To give more front wheel clearance as in this shot, for the 21" front wheel fitted, with full suspension movement. You can see why Scott decided to go it alone and build his own frame for the BSA, the two seat tubes had also been pulled in to make the waist area slimmer. 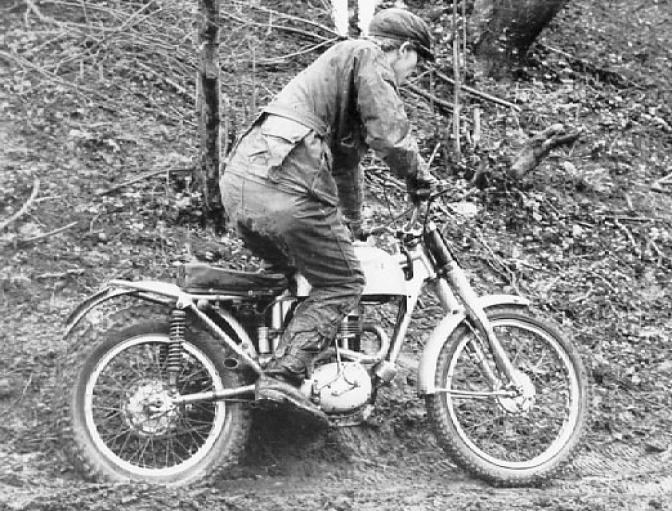 In addition to his trialling and scrambling Scott had tried his hand at grass-tracking, on a B40 engined "Elstar." So influenced by that frame, and the one from the HT Ariel, Scott and his father designed and made a frame for his trials bike. With Brian Martin's blessing and support the frame was completed by early November 1965, and first time out riding in a Midland Centre Group Trial he won the event. The higher management at BSA had know idea about the frame, or what the Comp shop were doing. So when two weeks later after Scott had won the British Expert's,the press where clambering for information about the New Bike? Brian had a lot of explaining to do, but passed it off has just an experimental machine. This satisfied the top men at BSA, who had already used Scott's win in the British Experts to plaster the motorcycle weekly journals with full page adverts saying how good the BSA was. But Scott found it most frustrating when BSA could have so easily built replicas of BOK228C. without that much expence. Anyway Scott continued to ride the bike in all the major championships and just kept the heavy bike for trials like the "Scott", where it was tough going for a lightweight machine. 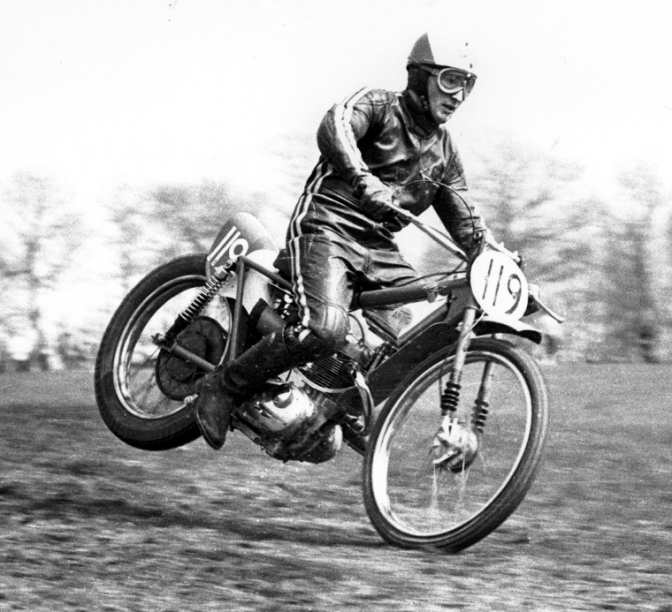 Scott eventual bought all of his bikes from BSA in 1967 and continued to ride BOK228C up until 1969. This is the famous Hawks Nest section. This photo and thousand more are available for purchase from Deryk. This is Scott's last BSA trials bike, but now owned by Colin Dommett. Photo Courtesey Deryk Wylde 'Offroad Archive". 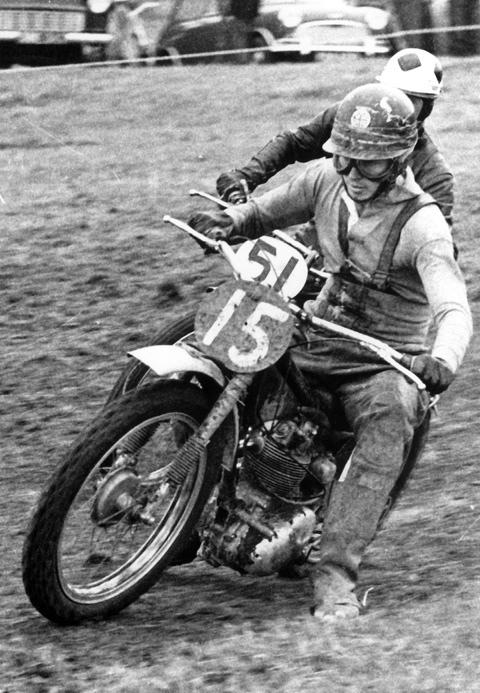 Here is Scott riding his BSA Antig Grass-Track bike. this was 1966-7 when Scott was using the money he earned Grass track racing to buy bricks and motor for his house. BSA were still supplying the parts for the bikes, and Scott got through a fair few parts with some spectacular blow ups with the grass engines. Right remember the name "ANTIG". then look at the next shot. Photo Courtesy Deryk Wylde. "Offroad Archive". This is Tig Perry of "ANTIG" Fame superb grass-track rider and frame builder.ANTIG Engineering started in 1966. Tig went on to buy the HAGON frame business too. So whats this got to do with Scott Eliss and his trials bike? Well has I stated above, I think that Scott had two frames on his last BSA trials bike. Now look at the gusseting around the Grass bike Tig is riding, and then look above at the Derek Hopkins photo of Scott's trials bike. "Snap" they look the same. Tig and Selwyn Perry both lived in Norton Gloucester....Tig started building the "ANTIG" frames here , leaving his elder brother Selwyn to build his frames near Newent on the Ross-On-Wye road. These were the "ANSEL" Grass bikes. and Selwyn .......(Ansel), Cheapside, Newent, Gloucester) . Photo Courtesy Deryk Wylde "Offroad Archives" again. Look at the motor, and the cases look very much like the "Cotswold" motors put together by Roger Taylor, (RTS), and John Husband . 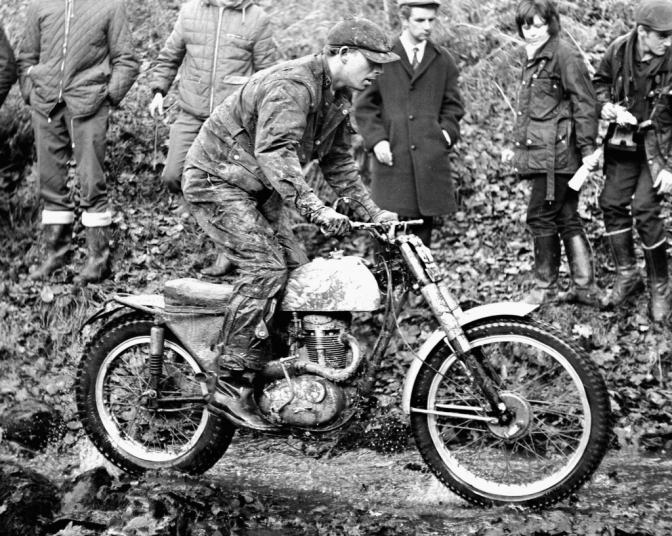 Well you remember the first time out for the Scott version of the BSA Trials bike. And this would be Number one ,He met Colin Dommett to go practicng and then back to the CoTTon factory to repair the footrests. Then Scott ended up with a "ANTIG" grass bike from the same city. This was only probably because of the sudden passing of Alf Ellis after his fatal car crash, well you can read the ELSTAR page for that. So I am going to stick my neck out and say that the Nickel Plated frame, the one that eventually got back to Colin Dommett was built by ANTIG Engineering Gloucester. Unless any one says any different? 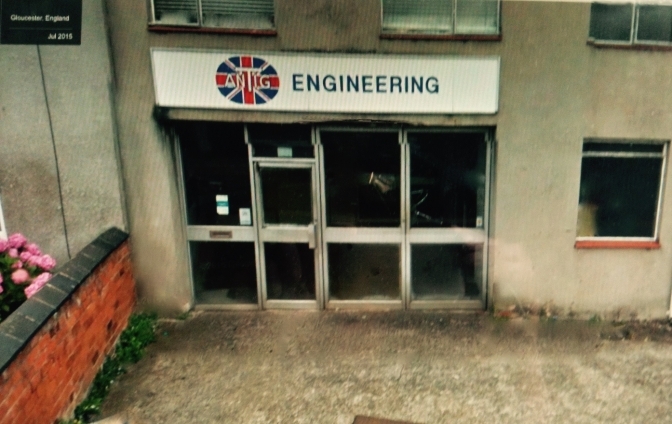 ANTIG engineering ,St James Street Gloucester. This is my replica in build of BOK228C. OK, I know this is a really bad picture taken with my I phone , and I will replace it as soon as possible. But it shows now how close to the Scott bike I got with only a photo from the Don Morley book,Classic British Trials Bikes. so I am really pleased. even more now I have realised that the Plated frame must have been later manufacture. Now I am finally getting the engine together in the Specification I have always wanted. Just one more picture to show how much tyre clearance there is with a Sports Cub swinging arm? And this one on my frame has been lengthened by 1"inch. by me. But a Triumph Cub which the bike Scott set out to build to emulate the "Works Cub" he had been riding before the BSA was a lot slimmer and lighter bike to ride.